Mojo Monday is having a celebration for their 300th sketch! I have seriously been lacking mojo, which is why you are seeing this post on a Sunday evening...just a few hours shy of the cut off time! I recently returned from the annual Close To My Heart convention....I manged to bring home some type of crud along with my new supplies! You know it is bad when you have stamps just waiting to be inked and no new projects are being created! The upcoming Fall/Winter Idea Book is filled with gorgeous new stamps, papers and embellishments. I decided to go all out on the fall theme with my take on the sketch. I incorporated some of my favorite new embellishments from the upcoming release. It was love at first sight for the Rosewood Mini Medley Accents Collection. You are sure to see more of this gorgeous bling on projects to come. 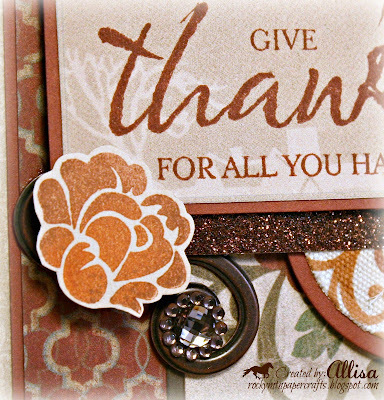 I kept the inside blank for now, I almost stamped Happy Thanksgiving on the inside....but was sure I would catch some grief for rushing the holidays! It is not my goal to rush the holiday season, but I am all for a little cooler weather! It is being unseasonable warm here in Wyoming! Since I am not yet sure of the occasion the card will be utilized for, I only added Bronze Shimmer Trim for a little bling. 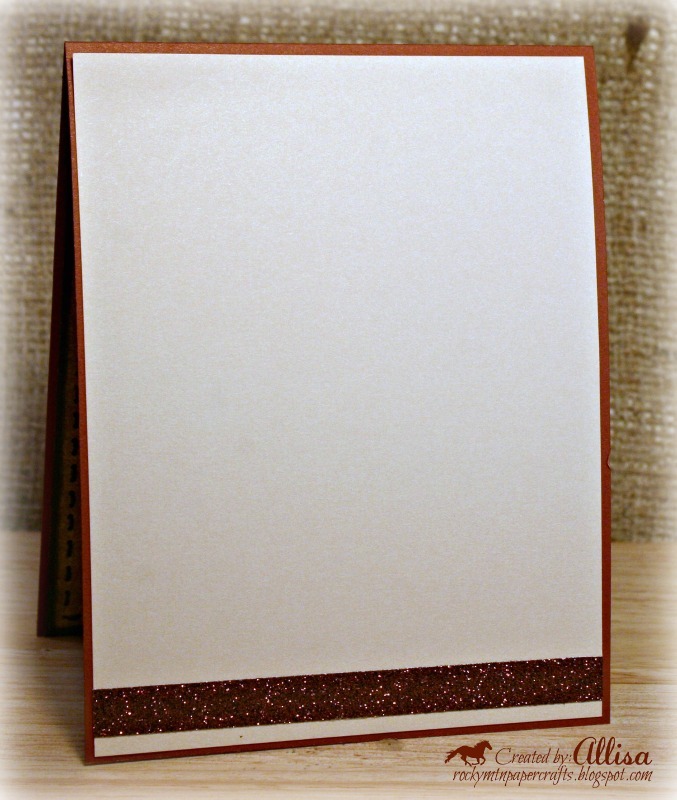 The upcoming catalog will feature the Shimmer Trim in four colors! Design Tip-I inked my small flower stamp with Autumn Terracotta Pigment Ink, then I added Barn Red Pigment Ink along the edges. I love using the pigment inks for solid stamps, you get great smooth coverage with ease! Gorgeous!! Love the new paper and stamps! I see my wish list increasing!! My first thought was the same as your first comment..."gorgeous". I'm happy to see something created with that paper pack since I had a feeling it might be prettier than pictured in the book. oh I really like this. Great use of the sketch and your color combo is fab! thanks for joining us at Creative Corner Challenges this week and hope to see you again. Simply beautiful Allisa! Thanks so much for sharing your creativity with us at A.R.T. and joining in on our COLOR CHALLENGE this week! Hope you'll join us again next week!